Sonal Priyadarshini from Ranchi, B.E. - B.Tech Graduate. HR HR ADMINISTRATION HR GENERALIST HR GOOD COMMUNICATI.. HR MANAGEMENT HR OPERATIONS HR ER HR POLICY IMPLEMENT.. HR / CSR HR ADMINISTRATION & ..
are one of expert skill area's of Sonal Priyadarshini . 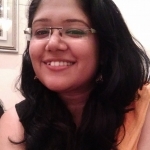 Sonal Priyadarshini is working in Human Resources industry.